Far Horizons isn’t like that. Far Horizons is one of those enabling, encouraging and (sorry – buzzword alert) empowering tales of an ordinary bloke on an off-the-shelf bike who chose to go on a very long ride. He didn’t go over the Himalaya or across the Outback or up the Amazon. 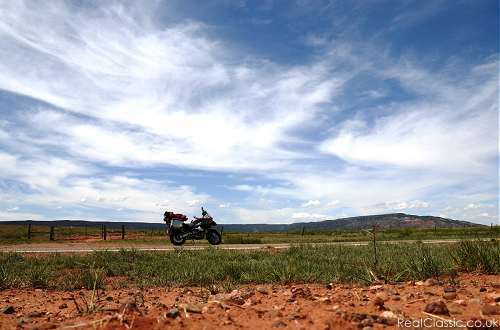 He chose to start his round the world ride in North America – foreign, yes, but familiar, and mostly English-speaking. This is an adventure by and for everyman. There’s nothing at all to stop you or I doing exactly the same thing, should we choose to do it. Andrew Earnshaw hit that moment in life at a certain age when circumstances conspired to present him with a ‘now or never’ opportunity. He’d just left a long-term relationship and had one of those health issues which parades a great big flag of mortality front and centre. So he carpe’d the diem all right. 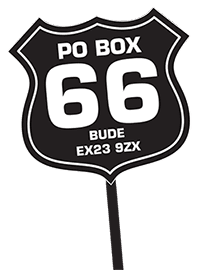 Bought a BMW, got to know it, took a professional leave of absence, shipped the motorcycle over the big briny to Baltimore and set off to circumnavigate North America (including great big chunks of Canada), and see something of the world. This journey took place at an inauspicious time, just when the world economy was wobbling. Indeed, the big banks collapsed part-way through Andrew’s journey – now that’s a scary proposition. Bad enough to lose all your cash and assets at home, but for the banks to go belly-up while you’re halfway around the planet, leaving you stranded in a foreign land on a tourist visa… now that’s daunting. But it’s not actually as intimidating as getting to grips with the reality of America, on your own, with little more than a SatNav and a lifetime of Hollywood movies to guide you. America – as so many travellers have discovered – is exactly like it looks in the films. And it’s nothing like it looks in the films. Andrew has to overcome that bewildering sense of dislocation and the universal misunderstanding of scale (America is big: really big) and get to grips with riding his BMW for hundreds of miles each day. He’s on a schedule, to pick up his girlfriend in California; to meet chums at various points, and to return in time to ship the bike home. And he has a tight budget, an overloaded bike, a stab-in-the-dark sense of direction (at one point while trying to leave Canada he manages to lose America: all of it) and an awful lot of time alone with his thoughts on the open road. So what we have here is a highly detailed travelogue. Andrew is an affable and entertaining travelling companion – often quick with a witty quip, never shy of laughing at his own mistakes and mishaps and candid enough to admit his fears and worries. Far Horizons runs to around 600 pages in softback and relates the highlights and low points of every single day of Andrew’s giant ride. Mixed in among Andrew’s quest for clean and cheap motels, his ongoing battle with the SatNav, his search for something resembling nutritious food (fat chance, literally), his concerns about being bothered by bears, his goal to meet moose, his experiences with riding gear, passports, paperwork and all the other travelling jazz; amid the daily rituals come his encounters with real-life America, and his impressions of the people he meets and the places he visits. At one point he says something along the lines of ‘I had so much distance to cover each day that there was no time for sight-seeing’ – but that’s far from accurate. Overall, Andrew succeeds not only in telling his own travelling tale but also in capturing a snapshot of modern-day America. He discovers along the road not only the hospitality of strangers, but also an unexpected situation of gradual decline. The banking crisis aside, Andrew encounters a country in transition. Oh, and the odd bear or two. The next leg of Andrew’s stop-start world tour is going to be Russia. Talk about culture shock! 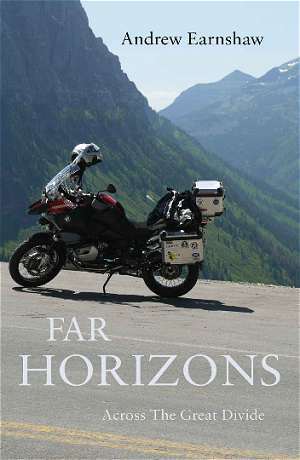 Far Horizons by Andrew Earnshaw is published in paperback and electronic editions by Matador, ISBN 978-1780885285.